Ok, so you’re knee deep in real estate investing and now you want to start to generate a cash buyers list. 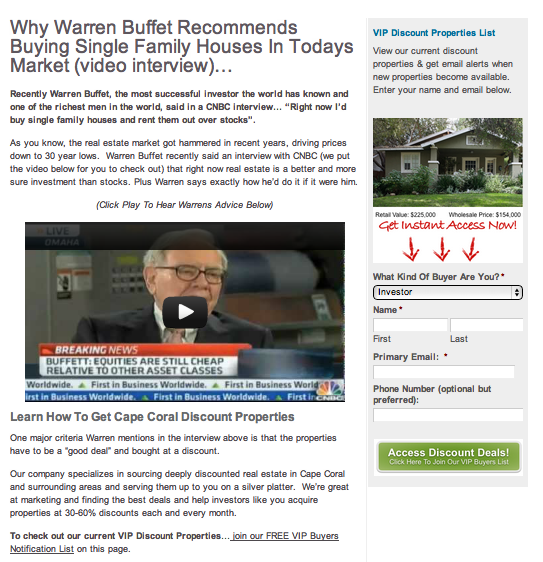 Do you drive them to your main real estate investor website and hope they punch in their information to join your cash buyers list… or do you learn how to set up a real estate investing landing page (some people call them squeeze pages or lead pages)??? The answer is both… but if you really want to generate a lot of cash buyer leads for your real estate investing business you’ll want to set up what we call “Lead Pages.” In this post we’ll show you why landing pages work, we’ll show you real estate landing page examples, and show you how to get your own landing pages up and online quickly. Landing pages have been used online for a decade or so… evolving each year it seems to add in some fancy flashy new gizmo to help increase conversions. You’ll see videos on many landing pages, pictures, audio, some are fancy looking… others really plain and simple. In the end, it doesn’t matter what a landing page looks like… as long as it converts visitors to leads for your business. Without cash buyer leads you can’t sell your houses. Without selling (or wholesaling) your houses… you can’t cash checks. Without cashing checks… well… you can’t eat. Not fun. Lead Pages (or as people call them, real estate investing landing pages or squeeze pages) have one goal and one goal only: To provide (solutions) value in exchange for a website visitors contact information so you can follow up with them. A good squeeze page doesn’t have a bunch of links, not a lot of options, etc. Is there a specific design that always works the best? How can we tell if a landing page is really working well? What do I use to build my own real estate lead pages? First, NOPE, there isn’t a specific design that always works the best. What works really well for your real estate investing business and your market may not work as well as another design (or message) on another real estate investors website. But, there are elements that usually work well. Really, those are the only elements that are extremely important and pretty much are needed on any landing page. Yes, you can use pictures and videos… but definitely test the video versus just the text with no video… because you’d be surprised that often the one with just the text (no video, unless the video is killer) usually works better. Which is good news for you. Example 1: Very simple page, lots of whitespace on the page, offering a free guide to the visitor. Opt-in box on the right. Example 2: An education based cash buyer generating lead page. Uses credibility from a well-known person to relay the message. Example 4: A cash buyer page we came across online that looks great and I’m sure works well (since they’re sending paid advertising to it). Notice the structure of the page is essentially the same as the above 3… but with fancier graphics. 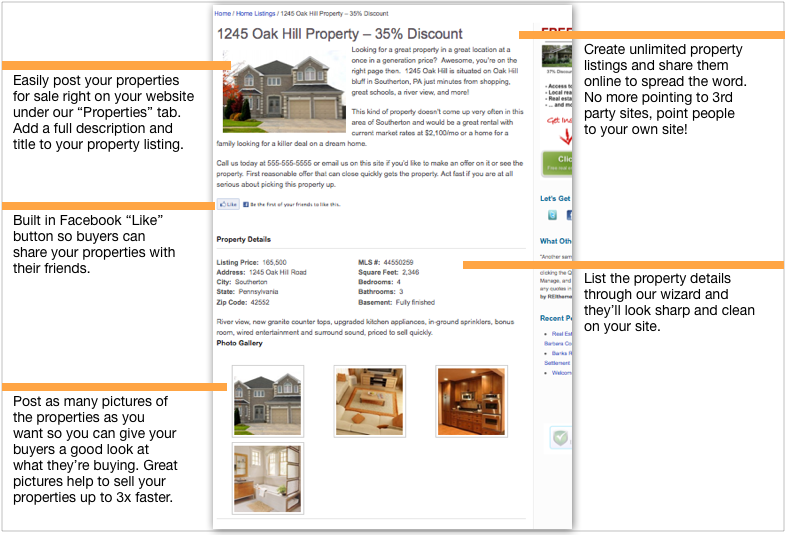 The reason we’re showing those real estate lead page examples is mainly so you can start to learn why things work… rather than just copying things without knowing why you’re copying. We’re all about the whole “teach a man to fish” thing… so you understand why things work so you can take full control over your own marketing… but we also like to make things easier for you with our Carrot software that will help you set up your lead pages for you. Is My Landing Page Working Well? 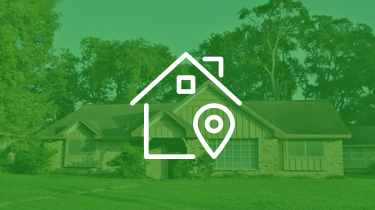 As far as being able to tell if your landing page for your real estate investing website is working well… there are a couple ways. 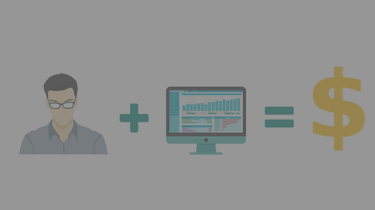 The simplest… is if you’re getting leads. Are you getting anyone to put in their info and send it to you? If so, it’s working. Now, if you want to make it work better… you have to “test”. It sounds fancy… but all testing is, is tracking how many people visit your page versus how many actually “opt-in” (put their info into your opt-in form). So, if you have 100 people that have seen your page and 20 have put their info in… it is converting at 20%. Now all you need to do is get some software that helps you track that. Google Analytics has free tools that will help you do it, or our Carrot website lead generation system has a built-in conversion rate tracker on all of your forms so you can see exactly which ones are working the best. What Do I Use To Build My Own Real Estate Landing Page? It really depends on the skills or budget you have. If you have money to put into the project... hire a web developer who has a LOT of experience in generating leads online and knows everything inside and out about creating lead pages that work. As a warning, 98% of web developers have no clue what converts… many will say they do. 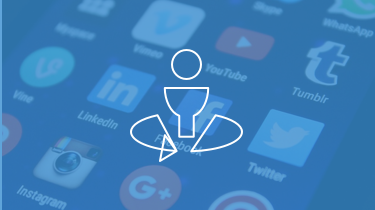 Always get references, have them show you actual pages with conversion #’s… and make sure they know how to use tools like Google Analytics so they can help you put in conversion tracking so you know if their pages are working. You should be able to get a solid lead page created for under $200 by a competent web developer to get the page set up… then whatever they charge after that to set up the Google Analytics, graphics, make changes to the page as you test, etc. Overall, over a period of a year, you can probably have a solid web guy do this for you for under $700 a year. If you’re on a really tight budget and plain and simple absolutely have no cash to invest in a solid lead page system… you can “swipe” other pages, learn HTML so you can customize the HTML page, then put it on your own hosting account. This will probably take 3-4 hours of your time if you know some HTML, or a few days minimum if you don’t know HTML yet. Blowing more time and money in the end because I was just trying to “save” some cash. But, if you absolutely have no money to invest… this will be your only route. If you have a small budget but want a professional result that works… find a real estate investing website system like Carrot that has cutting edge real estate investing specific lead pages in the system. Look for something that has simple looking Lead Pages (simple is better) and that are flexible. The worst thing is when you’re tied to a specific design and specific content that you can’t change. Make sure you can edit the content on your Lead Pages so you have full control. In addition, make sure the system tracks the traffic to your lead pages and shows you conversion rates so you’re not in the dark. 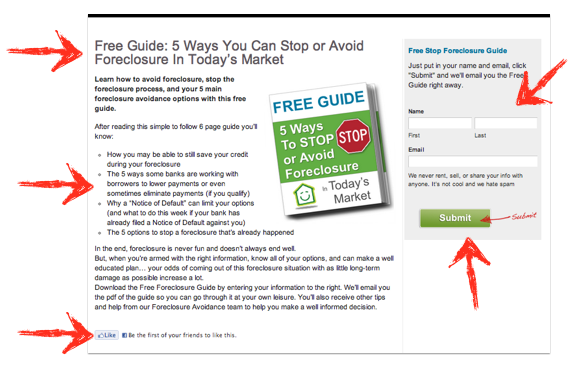 Last, make sure there are several options on where the leads go after they opt into your Lead Pages. If you use a system like Aweber (the email marketing system we use) you’ll want your lead pages to integrate for free with Aweber. Carrot will let you use your Aweber forms, MailChimp forms, or our custom form system on your Lead Pages… and it’s crazy easy. I just went over what a Lead Page is (or squeeze page), why they work for real estate investing businesses, what good ones look like, and 3 options on getting your real estate investing lead page up and online. 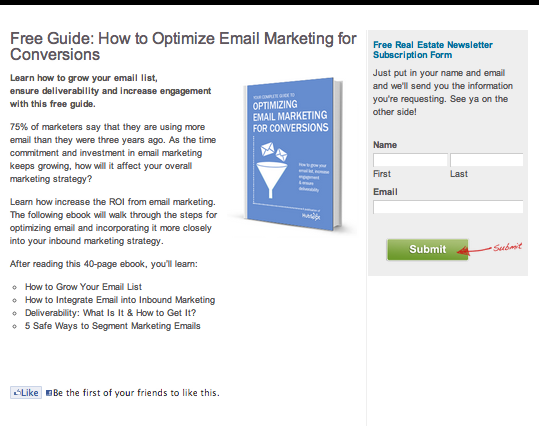 First, if you don’t have a Lead Page and you’re a wholesaler in real estate… you NEED ONE. I’ve personally built very targeted cash buyers lists well over 500 buyers 100% online via a squeeze page… it works really well and you’re essentially leaving money on the table if you’re not using them. Next, decide your budget, skills, and even more important… how valuable your own time is worth. People try to save money by hiring things like this out cheap (thinking any web guy will know how to create a landing page that works) or they try to learn it all themselves in the name of “saving money”. If you don’t already know HTML (if you don’t know what HTML is, I’d highly suggest you don’t do it yourself) then you’re going to be investing a lot of your own time and energy that you should be spending actually finding deals and making offers. In the time you learn HTML and hack away at things yourself you could have potentially done a deal that pays you $5k – $20k (which would more than pay for a solid lead page system). Usually, the option that makes the most sense is to piggyback on a lead page system that already works and that you can have full control over whether you know HTML or not. Of course, we’re pretty darn bias to our own real estate investor websites lead generation system… you should check it out and see if its right for you. But, there are other systems out there too that you may look at. By far, the very BEST article on the Art-‘n-Science behind Squeese Page Layout [and WHY!]. Kudos, Trevor, for a job SUPER-well done.